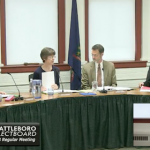 Water & Sewer issues will be the bulk of the Brattleboro Selectboard’s next meeting. They’ll talk about rates, repairs, reservoirs, energy use, odors, and improvements. They’ll also approve liquor licenses, announce committee vacancies, apply for a grant and more. You can add other items during Public Participation. 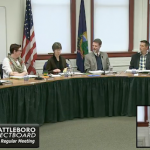 The Brattleboro Energy Committee will meet on Monday, March 4, 2019, at 5:00pm in the Hanna Cosman Meeting Room at the Municipal Center. 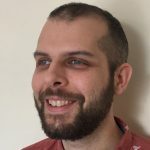 The Brattleboro ADA Advisory Committee will meet on Friday, March 8, 2019, at 9:00am in the Hanna Cosman Meeting Room at the Municipal Center. The Brattleboro Energy Committee will meet on Monday, November 5, 2018 at 5:00pm in the Hanna Cosman Meeting Room at the Municipal Center. The Brattleboro ADA Advisory Committee will meet on Friday, November 9, 2018 at 9:00am in the Hanna Cosman Meeting Room at the Municipal Center. The Brattleboro Energy Committee will meet on Monday, October 1, 2018 at 5:00pm in the Hanna Cosman Meeting Room at the Municipal Center. The Brattleboro Energy Committee will meet on Monday, August 6, 2018 at 5:00pm in the Hanna Cosman Meeting Room at the Municipal Center. The Brattleboro ADA Advisory Committee will meet on Friday, August 10, 2018 at 9:00am in the Hanna Cosman Meeting Room at the Municipal Center. Windham Regional Commission’s Windham County Renewable Energy Program is looking for project proposals of renewable energy installations in Windham County. 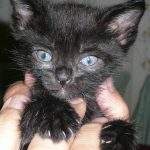 The projects require a minimum of 50% cash or in kind match. This program has funded 9 projects within Windham County. 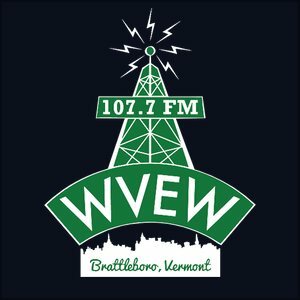 The Brattleboro Energy Committee will meet on Monday, June 4, 2018 at 5:00pm in the Hanna Cosman Meeting Room at the Municipal Center. The Brattleboro ADA Advisory Committee will meet on Friday, June 8, 2018 at 9:00am in the Hanna Cosman Meeting Room at the Municipal Center. It was a night of big things for the Brattleboro Selectboard – a big, new fire truck was ordered, and plans for a possible big $32.5m dairy processing facility were presented. The board got an update on skatepark finances and schedule, tires in the wetlands will be cleaned up next fall, a letter about Act 46 stalled, the leaf pickup schedule is being re-examined, and goals and plans for the coming year were discussed. The board discussed energy matters, compassion, and diversity. The Brattleboro Energy Committee will meet on Monday, April 2, 2018 at 5:00pm in the Hanna Cosman Meeting Room at the Municipal Center. There will be no Town panhandling sign. 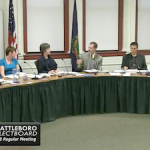 That was the split decision of the Brattleboro Selectboard Tuesday evening. The board had an active and long night. Much of it had to do with financial matters and planning, such as approving a letter of intent to rent space in the Municipal Center, reviewing long term financial plans, buying a fire truck, debating the thickness of single use plastic bags, and contemplating energy issues. Budget season starts officially at the next meeting, but it peeked its head in and said hello this week.